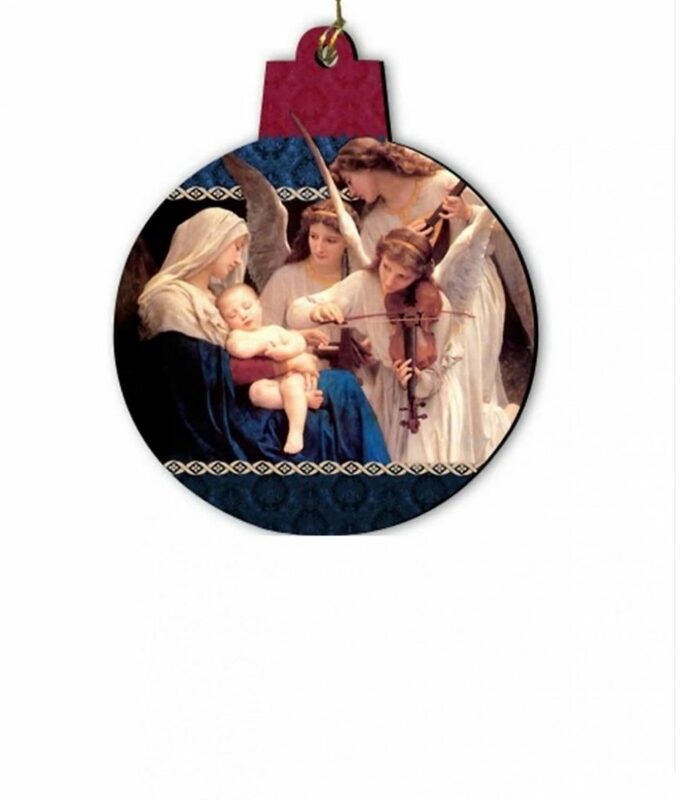 There is a Catholic tradition that Christmas decorations go up on the 8th December, Solemnity of Mary’s Immaculate Conception, or around the First Sunday of Advent, and stay up until the Epiphany which follows twelve days after Christmas, on January 6th. Others prefer to keep the crib until the 2nd February, the Presentation of Jesus in the Temple 40 days after His birth (known also as Candlemas Day, when the blessing and procession of candles is included in the liturgy). 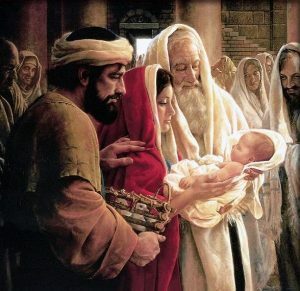 In the Extraordinary Form of the Mass, this ‘Christmas Feast’ is referred to as the Purification of Mary: The Torah commanded that a woman who had given birth to a son should not approach the Temple for 40 days; after which time she was to offer a sacrifice for her purification. By another requirement of the Law, every first-born son was to be considered as belonging to God (since the first-born sons of Israel had been spared in Egypt), and was to be redeemed as narrated in Luke 2:22-40. The word ‘Epiphany’ comes from the Biblical Greek word ἐπιφάνεια, epipháneia, meaning ‘manifestation or appearance’: It celebrates ‘the revelation’ of God in His Son as human in Jesus Christ. “After Jesus had been born at Bethlehem in Judaea during the reign of King Herod, some wise men came to Jerusalem from the East. 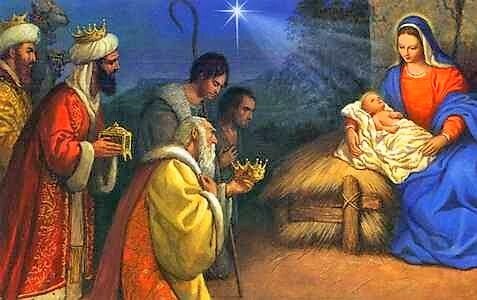 ‘Where is the infant king of the Jews?’ they asked. ‘We saw his star as it rose and have come to do him homage’…”. Balthazar: who brings myrrh, a funeral embalming ointment, representing morality and suffering, foretelling His Passion on the cross and the anointing when He was laid in the tomb. Festivities for the ancient Christian feast day vary around the world, from swimming in icy waters (e.g. Bulgaria) to exchanging presents (e.g. Spain), special foods (e.g. Mexico) fireworks (e.g. 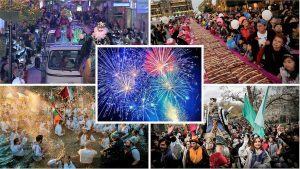 Santo Domingo), parades and cavalcades (e.g. Gibraltar). In many countries the day is a public holiday. As recently as the 1950’s, in Britain, the eve of the Epiphany or the ‘Twelfth Night’ was a night for wassailing. Wassailers, like carol singers, go from house to house singing and wishing their neighbours good health. The Drury Lane Theatre in London has had a tradition since 1795 of providing a Twelfth Night cake. 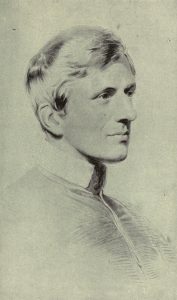 The will of Robert Baddeley made a bequest of £100 to provide cake and punch every year for the company in residence at the theatre on 6 January. The tradition still continues. Another tradition that remains to this day, is that the bones of the 3 Kings are located in Cologne Cathedral. Originally situated in Constantinople, they were brought to Milan in an oxcart by St. Eustorgius I Bishop of Milan (from 343-49), to whom they were entrusted by the Emperor, Constantine. 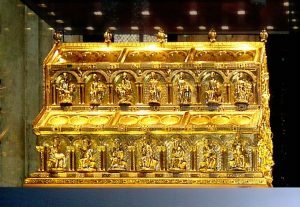 In 1164, the Holy Roman Emperor Fredrick I ‘Barbarossa’ donated the casket of the Magi, located at the church of Saint Eustorgius, to the Archbishop of Cologne, Rainald of Dassel in appreciation of his services on the Emperor’s Italian campaign. 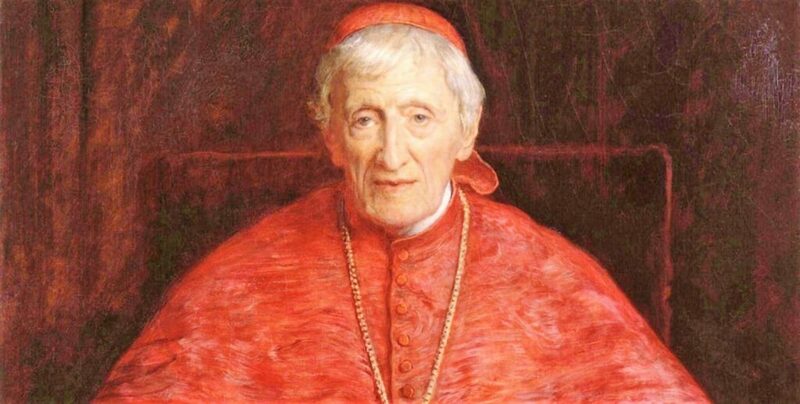 Two years previously, the Emperor, with the support of the Archbishop (who was also one of the most powerful princes of the Holy Roman Empire in Germany and Archchancellor of Italy) had taken Milan, which had risen up against Frederick, and seized the relics. 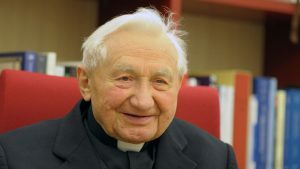 Archbishop Rainald campaigned to make the relics, which had been virtually unknown in Milan, famous throughout Europe and indeed, the entire Christian world. Cologne Cathedral become one of the most significant places of pilgrimage in Europe. These relics quickly attained outstanding importance, not least among German royalty. On their way home after their coronations in Aachen, German kings would traditionally stop in Cologne to venerate the relics of the biblical Wise Men, who were revered in Medieval times as the first Christian kings. Der Dreikönigenschrein or ‘Shrine of the Three Kings’ have been a site of constant pilgrimage to Cologne ever since. At the beginning of the year, we tend to look back at what big events there were in the last year which played a major part in our lives, and we look forward to a year which we pray will offer us security, health and peace. One of the main topics which dominated the year we are leaving and which will continue to dominate this coming year is Brexit, with its uncertainties as things stand now and the dangers and consequences that might have to be faced. We are urged by St Paul to pray for “ all those in authority so that we may live peaceful and quiet lives in all godliness and holiness” (1 Tim. 2:2). Let us pray for our political leaders that God may help them in their efforts to work for the common good. There are other issues which we will be facing in the new year, which will have great influence on the kind of society we will be living in. While not everything is going to be perfect and there will be things about which we might complain, there is much to be grateful for and many blessings for which we should be thankful to God. While we may have things to complain about, things that are not quite right and could be better, when compared with what many other people have in other parts of the world, we have so many blessings to be thankful for by comparison. This year, on the 1st January, we celebrate the 52nd World Day of Peace. The Holy Father in his message for this year has emphasized the role of politicians and political life which helps in furthering peace in the world. 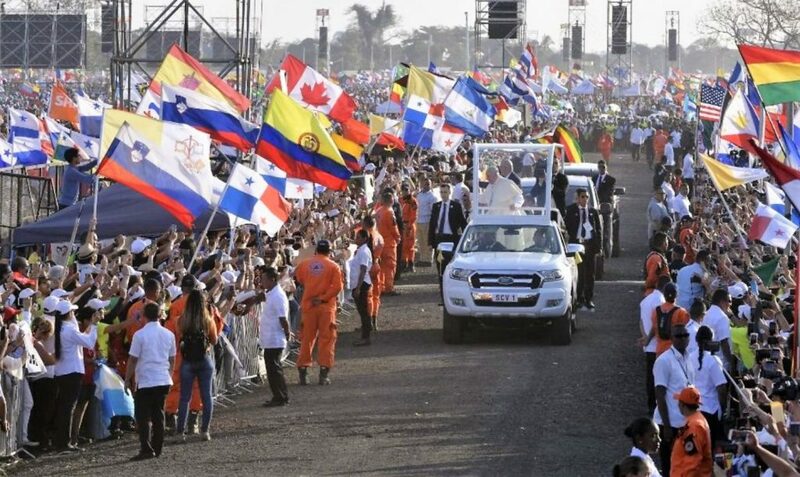 The title of his message is: Good politics is at the service of peace. 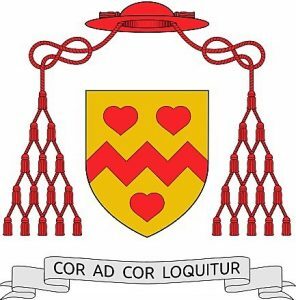 In his message the Pope refers to the “Beatitudes of the Politician”, proposed by Vietnamese Cardinal François-Xavier Nguyễn Vãn Thuận. 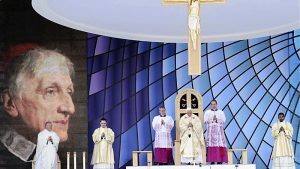 In this context, let us also remember the observation of Pope John XXIII: “Man’s awareness of his rights must inevitably lead him to the recognition of his duties. The possession of rights involves the duty of implementing those rights, for they are the expression of a man’s personal dignity. And the possession of rights also involves their recognition and respect by others”. I pray that we may all help, in our own small way, to further peace around us. I wish you all a very happy new year, full of God’s peace and blessing. Christmas is about the birth of Jesus! 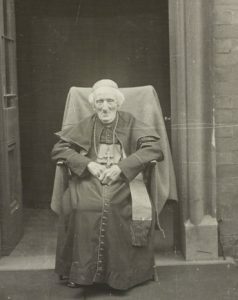 I would like to share with you something that the great preacher, Saint Alphonsus Liguori, said, “I think God must have said to Himself: Man does not love Me because He does not see Me; I will show Myself to him and thus make him love Me. 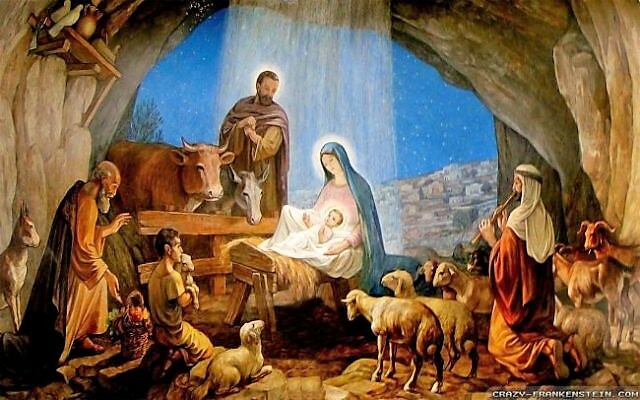 God’s love for man was very great, and had been great from all eternity, but this love had not yet become visible… Then, it really appeared; the Son of God let Himself be seen as a tiny Baby in a stable, lying on a little straw”. Christmas is about God making himself visible in Jesus to show his love for us. Christmas is about the birth of Jesus. The letters M – A – S after a word mean “the feast of”. Therefore the actual word “Christmas” means the feast of Christ. It would be a great pity if we were to ignore the meaning of the word Christmas and refer to this period of joy and peace in other terms, like the festive season or the holiday season. Christmas is festive in nature and we do enjoy a holiday in this period, but we must not eliminate the word Christmas for this period with the excuse that the word may offend others who do not share our belief. I can assure you that no other religion ever objected to the word Christmas when we celebrate the birth of Christ. No one objects to the celebration of the Chinese New Year, because of a fear that it might offend persons who are not Chinese or Buddhist; no-one objects to the celebration of Diwali, on the grounds that it might offend persons who are not Hindus. And rightly so. Why, then, should Christians be treated differently? To eliminate anything that refers to Christ in shops and superstores full of Christmas goods shows which way we are heading if we do not put back Jesus in Christmas. 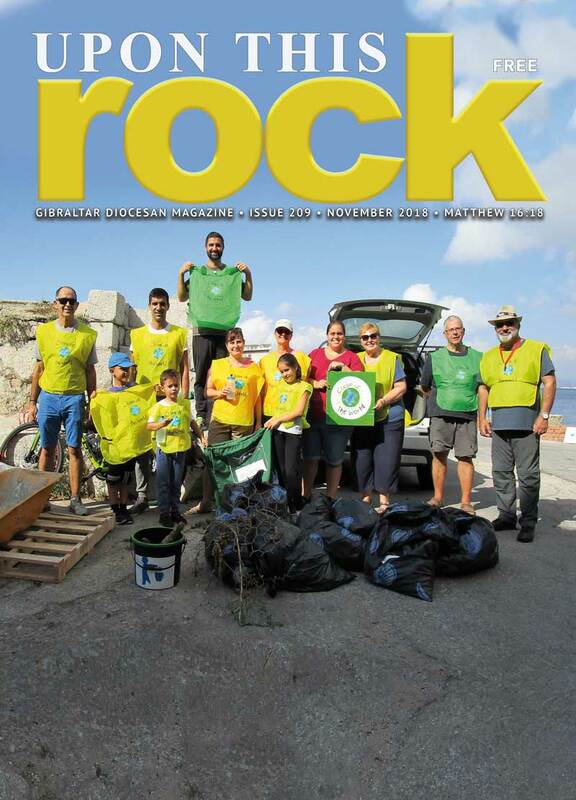 We pride ourselves on this blessed Rock for being a tolerant and friendly people, respecting each other and living in harmony with each other. That is essentially the message that Christmas brings to all of us. The birth of Christ was not glamorous. 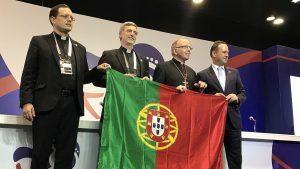 What the gospels tell us is that God in Christ stepped into the depths of our broken, sad and troubled world to bring us what we need: peace, reconciliation, forgiveness and a transformation of our lives. It is sad to notice that although we pride ourselves on being friendly and generous, when an issue arises which leads to different attitudes and opinions, the language that is at times used towards one another and about one another may be bitter, vindictive and hurtful. On social media in particular, people seem to lose all restraint in attacking those with whom they disagree. We have a choice. We can treat one another as a threat, abuse those who are different from us, misrepresent people’s motives and spread lies about them; or we can follow a better way, reaching out to others with care, attention and service. If that sounds simple, it is; and it is the simple message at the heart of the Christmas festival. As we celebrate Christmas this year and bring to mind the birth of Jesus, may our lives be deeply touched by God’s love. As we contemplate the child Jesus who is born, may our hearts be filled with joy. This is the time when we reach out to others who are in need of our support, care and love, those who are suffering in some way or other. Let us also remember and help out those in other places who are being persecuted, tortured and even martyred due to their beliefs. God is with us and shares our human life, the joys and challenges along with our pain and suffering. The word Emmanuel beautifully describes the gift of Christmas, it means ‘God is with us’. This is the main message of Christmas. Christmas presents a challenge to all of us. We are called to become messengers of Emmanuel, to help bring Christ’s love to the world. Let us be Emmanuel’s messengers, let us be his hands, feet and voice. Let us bring his love to all. May I suggest that now is the time to make an extra effort to keep Christmas not just on the 25th of December but throughout the year, by getting closer to Jesus. I wish you peace and joy this Christmas. I pray that our Heavenly Father will abundantly bless you and all those you love this day. May he shower you with every grace and blessing throughout the coming year. Happy Christmas. You came forth from the mouth of the Most High (Sirach 24:3), and reaching from beginning to end You ordered all things mightily and sweetly (Wisdom 8:1). * Come, and teach us the way of prudence (Isaiah 40:14). and Ruler of the house of Israel (Matt 2:6; Micah 5:1; 2 Sam 5:2), You appeared to Moses in the fire of the burning bush (Exod 3:2) and on Mount Sinai gave him Your Law (Exod 20). * Come, and with an outstretched arm redeem us (Jeremiah 32:21). You stand for the ensign of mankind (Isaiah 11:10); before You kings shall keep silence and to You all nations shall have recourse (Isaiah 52:15). * Come, save us, and do not delay (Habakkuk 2:3). 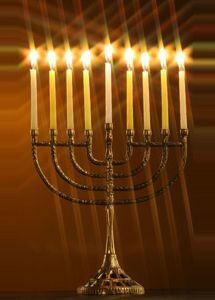 and Sceptre of the house of Israel (Numbers 24:17): You open and no man closes; you close and no man opens (Isaiah 22:22). * Come, and deliver him from the chains of prison who sits in darkness and in the shadow of death (Ps 107:10). 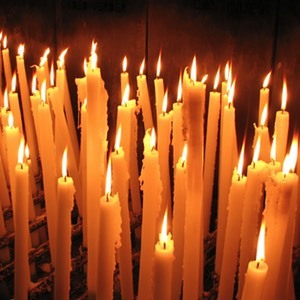 Radiance of the Light eternal (Habakkuk 3:4; Wisdom 7:26; Hebrews 1:3) and Sun of Justice (Malachi 3:20): * come, and enlighten those who sit in darkness and in the shadow of death (Ps 107:10; Lk 1:78). and the Desired of all, You are the Cornerstone that binds two into one (Isaiah 28:16; Matthew 21:42; Ephesians 2:20). * Come, and save man whom You fashioned out of clay (Genesis 2:7). our King and Lawgiver (Genesis 49:10; cf. Ezekiel 21:32), the Expected of the nations and their Saviour (Isa 33:22): Come, and save us, O Lord our God. 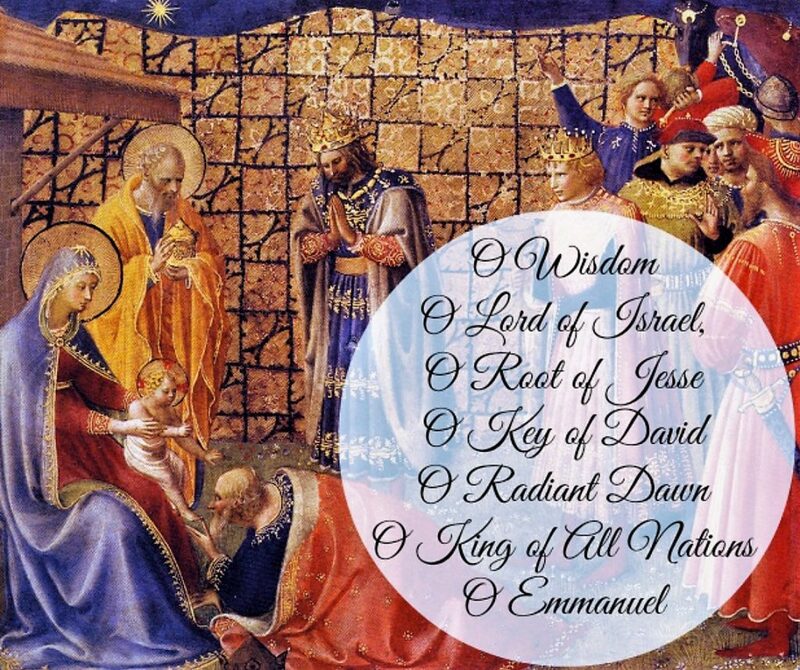 The truly ancient tradition of reciting the O Antiphons refer to the seven antiphons that are recited (or chanted) preceding the Magnificat during Vespers of the Liturgy of the Hours. 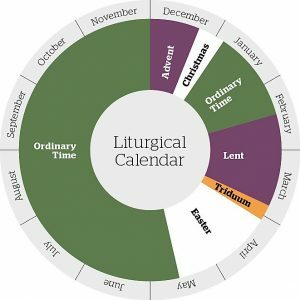 They cover the special period of Advent preparation known as the Octave before Christmas, Dec. 17-23. Tradition explains that the Benedictine monks arranged these antiphons with a definite purpose. If one starts with the last title and takes the first letter of each one – Emmanuel, Rex, Oriens, Clavis, Radix, Adonai, Sapientia – the Latin words ero cras are formed, meaning, Tomorrow, I will come. 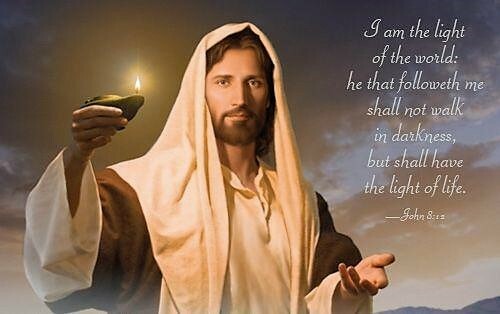 Therefore, the Lord Jesus, whose coming we have prepared for in Advent and whom we have addressed in these seven Messianic titles, now speaks to us, Tomorrow, I will come. 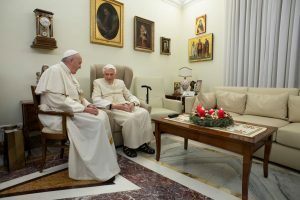 As is his custom every year, on 21st December at 18:15 the Holy Father, Pope Francis, went to the Mater Ecclesiae Monastery to visit Pope Emeritus Benedict XVI. He also gave him his Christmas presents! 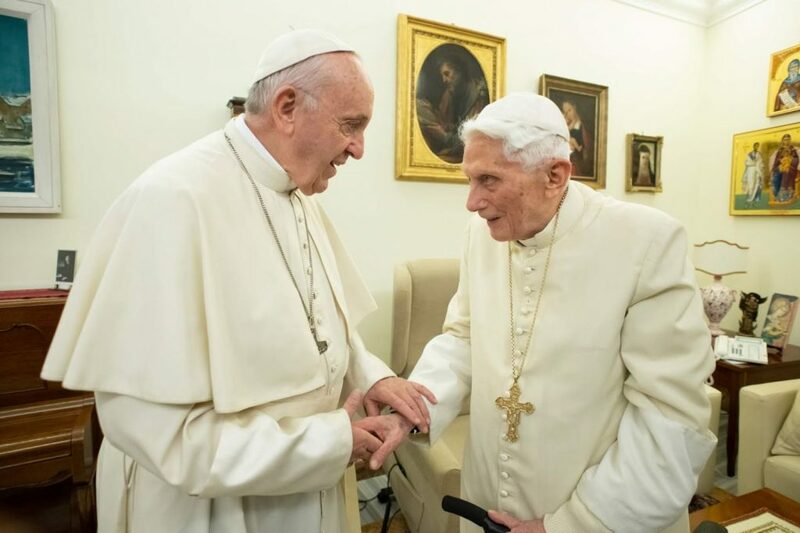 Although Benedict XVI at 91 understandably appears enfeebled with age, he remains in great spirits. 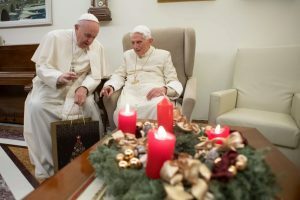 He is looking forward to his brother Monsignor Georg Ratzinger’s visit for two weeks after Christmas when he will be bringing him gifts from their birthplace in Bavaria. Despite Mgr. Georg’s almost total blindness, the two look forward to playing the piano and singing traditional Christmas carols!